The design chests of drawers in this collection stands out because of the combination of mango wood with different materials, such as metal and glass. The traditional production ensures a personal touch and makes these cabinets unique. Shelving units, room dividers, bookshelves and chests of drawers to put together a complete wall unit. 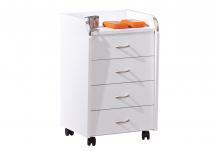 You'll also find handy units with drawers on wheels, which offering plenty of storage space. They are a good combination with the collection of desks and desk chairs.